Choosing the best color for every room in your home can be tricky enough when you know who will be using the space, and it can feel next to impossible when painting your guest room. 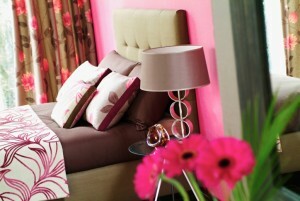 How can you choose a color that will appeal to everyone who stays in your guest room and your family? An in-home color consultation with a skilled color consultant can get the process rolling. Here are some of our best tips and tricks for painting the guest room. How Big is Your Guest Room? If you have a smaller sized guest room, a lighter color scheme is your best bet to make the room feel more open and larger than it actually is. Darker colors, especially in guest rooms, often make the room feel narrow and closed in. Does the window in the guest room or other lighting make the room bright or dim? If the room is naturally dim, always stick to lighter shades that will make it appear brighter. Your in-home color consultation will involve determining the purpose or feel in every room that you want a new shade of paint. When it comes to the guest room, most people want it to feel relaxing, calm, and tranquil. Think of the times of year that your guests visit (before the holidays, during major events) and plan your color scheme accordingly. Stick to spa colors like light yellows, gentle blues, and soft greens. How Much Does the Room Need? It sounds silly, but how much décor does the guest room really need? Many people love to go crazy decorating this new space in their home, but guests typically want a calming and quiet place to rest their heads. Don’t overload the guest room with paintings, lamps, furniture, and other décor. Instead, keep it simple when it comes to the paint color and the decorations.